Nvidia's patent lawsuit against Qualcomm and Samsung has already had many twists and turns, but the latest surprise to emerge from the lawsuit doesn't actually involve any of the participants. As part of the lawsuit Nvidia disclosed that it expects a HTC Nexus 9 tablet, powered by its Tegra K1 mobile processor, to be revealed in the third quarter of 2014. The third quarter of 2014 is ending pretty soon (on September 30) and we haven't seen much evidence of HTC's much rumoured return to tablets with the HTC Nexus 9. Whilst we might not see the tablet as early as this month, HTC has sent out invitations for a media event on October 8. This doesn't mean that an announcement of the HTC Nexus 9 is a foregone conclusion, however. The timing could be entirely coincidental, and Nvidia's expectations could be well off the mark. 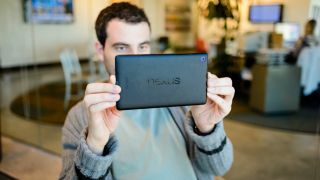 If the Nexus 9 is going to be running Android L, as some rumours have suggested, then its release date will be more closely tied to Google's plans for its mobile operating system, rather than anything Nvidia says in a lawsuit. Still, if the claims turn out to be true HTC might be a pretty upset that Nvidia has spoiled its big surprise, and it can be added to the list of companies that Nvidia has annoyed with its lawsuit. What about the Nexus 8?